I wanted to move into our new rental on Feivel to celebrate Bertie’s birthday on August 15th, so arrived on the 14th. Nobody was celebrating due to the severe heat wave. David, my city-challenged partner, is grateful our apartment is a mere five minute walk to the Arlozorov bus station, which means only a five minute walk to an air conditioned bus that goes to Jerusalem every ten minutes. Jerusalem may be hot, but it is rarely humid. Living in Tel Aviv only ten days, I have discovered my sweat glands. They are getting a good workout, which I assume is healthy for my skin. I haven’t fainted yet and remain upbeat. Our fabulous locale is also a five minute walk to the train station, so I visited my three grandchildren in Haifa, did the Haifa tayelet and returned to my own bed on Feivel by 10:45 PM. During my visit my nine-year old granddaughter gave me a tattoo of a peacock on my arm. With my new short haircut and my tattoo, I fit right into the city on the sea. Before I moved here I saw TA women from the point of view of a hill person who respects modesty. In a day I too wanted to shed all my clothes, wear short shorts and did not give a hoot if my bra strap showed. It took a mere two days to feel only pity for women who wear long sleeved acetate blouses and nylon stockings all because some men can’t deal with their urges when they see a bare elbow or kneecap. It’s interesting that in a hilly region, such as Jerusalem, houses have arches and convex rooms, whereas in a flat city, you have square and rectangular buildings and square and rectangular rooms. The only arch on Feivel is made by the gardener who shapes the shrubs. I am sure this difference in architecture, round versus straight, has far-reaching ramifications in other areas, but it’s too hot to think about it just now. We live on the third floor – sixty stairs, bordered by a strong wooden hand rail. Sometimes I wish I lived on the 2nd floor, but there are times, even in the heat, when I have reached the door to our apartment and I want to keep climbing. Climbing stairs will keep us young and agile, which is why I wanted to move to Tel Aviv in the first place. Also interacting with people, as opposed to trees and spiders, will keep me on my toes. I exaggerate. On the moshav, I interacted with Colette, the cashier in the local makolet, a few good friends and my upstairs neighbor. Too often I took walks on empty streets overlooking Hadassah Hospital or the new Highway One to Jerusalem. Occasionally I passed the Philippine worker accompanying his ward suffering from Alzheimer and we all exchanged hellos. If I wanted more than a broom and a stuffed grape leaf, I had to get in my car and drive to the mall in Mevasseret. I felt isolated on the moshav and over dependent on Henry Ford. In Tel Aviv I don’t feel isolated. I can walk everywhere or take a bus that stops three houses away. People of all ages and ideological persuasions walk on the streets or ride their bikes. My daughter and her family are a fifteen minute walk away. I saw them four times the first week. My Tel Aviv granddaughter learned “Head, Shoulders, Knees and Toes.” The wonderful Yarkon Park is twenty minutes away and even Jerusalem, the city I am forbidden to forget, lest my tongue cleave to the roof of my mouth, is a mere sixty-minutes from Feivel. Although there was no celebration on this unknown Zionist’s birthday, I have been blessed with a neighbor who knew someone who knew him. She is a woman after my own heart, who, after she tells me that he was a womanizer, recalls the military parade she watched from the roof of “our” building, new in 1961. “Everything north of here was a field,” she explains. “The road to our east was called Derech Haifa,” she says pointing, “not Namir. I saw shepherds and their herds of sheep and goats in the distance,” she says with a hint of sadness, the sadness and longing of a woman born in the small, familiar city of Tel Aviv, before it became home to start-ups and gays, electric bikes and hi-rises. Then she reprimands herself for becoming nostalgic. I don’t tell her that I too miss the shepherd from the corner on Derech Beit Lechem and Reuven. Rather, I tell her that Feivel left Europe for Jerusalem in 1933 and died four years later at the age of sixty-two in the holy city. It’s easier—and maybe healthier—being a Zionist abroad, I think to myself, or in this unholy city. 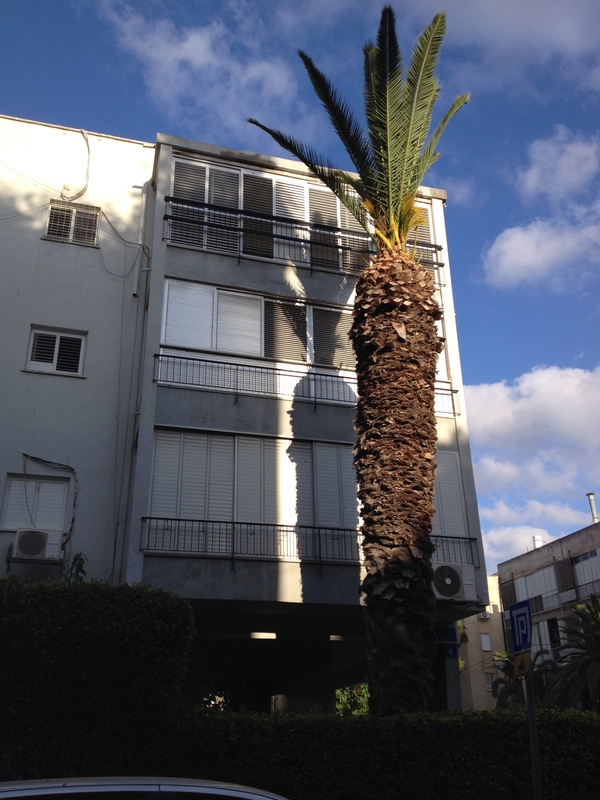 This entry was posted in Uncategorized and tagged Feivel, Tel Aviv. Bookmark the permalink. So that’s why you moved to Tel Aviv! Feivel! And all along I thought it was your grandchildren! I enjoy the vicarious connection to the early Zionists in this part of TA just as I enjoyed the vicarious connection to the 12 tribes in Bak’a. Judy, I enjoyed every minute of your insightful, informative blog! I read it while waiting 20 minutes in the post office to mail Jennifer’s birthday card. She won’t accept email cards any more and since it’s her 50th I thought I should obey her command! I am very envious of your incredible writing and your wry sense of humor! Don’t be envious. Be inspired. Kudos for the energy and courage to make a fresh start. Enjoy! Thanks Shosh. The hard part for me is staying in one place too long . . . I loved loved loved your post! I only wish–selfishly, of course–that you’d moved to Tel Aviv three years ago so we could have been a mere local bus ride (or vigorous walk) apart. Have you been to Cafe Henrietta yet? I think it’s close to you. Keep sending dispatches from the unholy city! Wonderful. You sound truly content and fulfilled. Thanks, George. So far so good, despite the humidity.